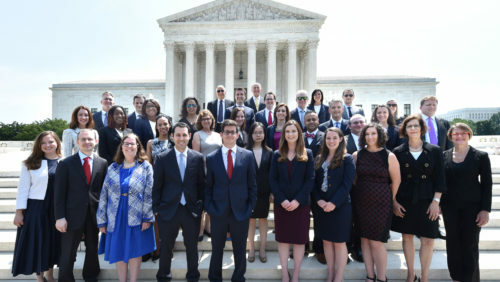 Keonna Carter (LL.M.’13)(second row, third from left) was one of 35 Georgetown Law alumni sworn into the Supreme Court Bar in June. 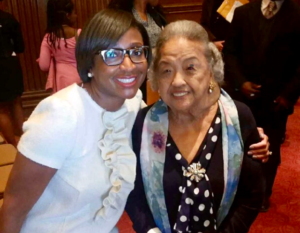 Carter’s journey to the law began as a sixth grader, when she was invited to the Supreme Court after winning an essay contest and met Cissy Marshall, widow of the late Justice Thurgood Marshall. If there were an award given for serendipity, Keonna Carter (LL.M.’13) would certainly win. All of the big events in her life have tied back to a Washington, D.C., citywide essay contest —“a special city needs special people” — that she won as a sixth grader in 1993. The prize: an invite to a reception in the chambers of U.S. Supreme Court Justice Thurgood Marshall. There were perhaps a dozen winners, with two from her school, Strong John Thomson Elementary. But sadly, Marshall died just weeks before the event. Carter’s entire sixth-grade class would write condolence letters to Marshall’s widow, Cissy. The reception went on anyway, hosted by Justice David Souter. Mrs. Marshall attended and read to them from one of the many letters she’d received after her husband’s death. “Of course, if Mrs. Marshall said it…” said Carter with a laugh. Inspired, she would go on to attend the University of Virginia and Northwestern law school before receiving an LL.M. in tax at Georgetown Law. She worked for Mayer Brown as a litigation associate and McGuire Woods as a private wealth associate. Carter then did a short stint as staff attorney in the D.C. Court of Appeals, where she argued cases in front of Supreme Court nominee Brett Kavanaugh. Lane Vanderslice was the lawyer who interviewed and hired her at Mayer Brown. Vanderslice asked all of the candidates why they wanted to be lawyers, and Carter’s is the only answer he remembers. Keonna Carter (LL.M.’13) with Cissy Marshall in 2017. There was just one thing: she needed two sponsors. Georgetown would provide one, but the other had to be a member. Which led to one more instance of serendipity. After sharing her story with an attorney in private practice, the attorney put her in touch with one of his colleagues, who just happened to be the last man Justice Marshall swore in to the Supreme Court Bar: Thurgood Marshall Jr. Carter was sworn into the Supreme Court Bar on June 18, with Thurgood Marshall Jr. as her sponsor (34 other Georgetown Law alumni were also sworn in that day).